Early Orthodontics for Children — Why So Important? There can be something precious about the gap between a child’s front teeth. It gives their smile an extra dash of character, and years down the road, you’ll fondly remember those happy little grins. But what if your kid’s teeth have more than a simple gap in the front? What if they are suffering from serious misalignment or a bad bite? Is it a good idea to get the problem treated even before your child’s adult teeth come in? Yes! Early orthodontics for children can have some major benefits. A child’s primary (baby teeth) do more than help your child eat and speak. They serve as “placeholders” for the permanent teeth that are developing beneath the gum line. Therefore, when a young person’s baby teeth are crooked, it is much more likely that the adult teeth will be crooked as well. Child orthodontics gets ahead of this problem by moving those first set of chompers into place. Many parents whose children have crooked teeth reason that they will wait to take their child to an orthodontist until all of their adult teeth have come in. That is a mistake because the period of time when your little one’s jaw is still developing is the ideal window of opportunity to correct jaw and bite issues. If treatment gets delayed, it is possible that your child will need surgery or tooth extractions later on in order to achieve a well-aligned smile. This happens because older bones are harder, and there is no longer any chance to correct the way they’re developing. If your child’s teeth are crooked, or your dentist takes x-rays and notes that there are some developmental problems with the teeth or jaw, it would be wise to schedule an appointment with an orthodontist. 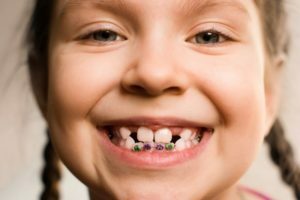 Ideally, this should happen before the age of seven because the typical timeframe from early orthodontic treatment is when a child is between 6 and 10 years old. The orthodontist will evaluate your child’s situation and make recommendations for treatment. Your young one might need braces. On average, kids have to wear their braces for about 18 months, after which your orthodontist will give your child a retainer to ensure that all the braces’ hard work doesn’t get undone. That is the phase I portion of orthodontics. Phase II treatment might be necessary once all of your child’s adult teeth have come in. This could include braces to fix any teeth alignment issues that weren’t corrected during phase I, but thanks to the first phase of treatment, phase II is usually short and simple. You might think of braces as the realm of preteens and teenagers, but that isn’t so! Even young children stand to benefit greatly from orthodontic treatment. Drs. Deborah Romack and Garret Mulkey are proud to serve patients of all ages. They can help your child to have a straight, healthy, and beautiful smile. If you are interested in learning more about early orthodontic treatment, please contact our office at 817-594-3806. Comments Off on Early Orthodontics for Children — Why So Important?